LEGO Systems, Inc. today announced new LEGO® Star Wars™ products based on the all-new Star Wars Rebels™ animated television series scheduled to premiere on Disney Channel this fall before it appears regularly on Disney XD. The action-filled series is the highly anticipated follow-up to Star Wars: The Clone Wars™ and will introduce a cast of exciting new characters in the Star Wars universe. The new building sets were unveiled at a Disney Consumer Products event Monday, February 17 by Freddie Prinze, Jr., who stars as Kanan Jarrus in the new Star Wars Rebels series. The company presented him with a custom 2-foot tall replica of his minifigure made completely out of LEGO bricks by Master Builders. LEGO Star Wars The Ghost building set is based off of the Rebel heroes’ starship, The Ghost, which has dual cockpits, a 360-degree rotating turret, two spring-loaded shooters and ejecting escape pods. The building set features 929 pieces and several new LEGO minifigures with assorted tools including Kanan Jarrus, Hera Syndulla, Zeb and a Stormtrooper™. Designed for ages 9 and up, the kit will retail for $89.99. The second building set, LEGO Star Wars Phantom, is an attack shuttle that works in conjunction with The Ghost set. The two models can be combined and the Phantom model features 234 pieces and includes folding wings, tools and a detachable cockpit with cargo hold where pilot Ezra Bridger can store his cadet helmet and blaster. Ezra Bridger and his grumpy Droid companion, Chopper, are also brought to LEGO minifigure form. The set is designed for ages 7 and up and will retail for $24.99. The introduction of LEGO Star Wars Rebels coincides with the 15th anniversary of the LEGO Star Wars collection, the first licensed property ever to come to life in LEGO form. The LEGO Group and Lucasfilm partnership has produced a wide variety of iconic construction sets since the first toys were released in 1999. Through the years, the LEGO Star Wars toy brand has offered more than 300 unique building sets from the original trilogy and newer storylines. 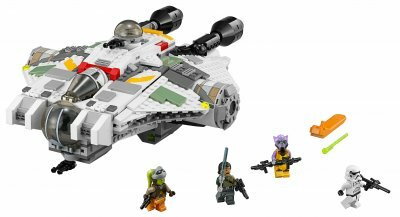 The two LEGO Star Wars Rebels models join 23 other new LEGO Star Wars sets that will be introduced throughout the anniversary year, including such icons as the Snowspeeder™ and the Imperial Star Destroyer™. A new collection of Microfighters builds mini versions of Star Wars icons and each includes a collectible minifigure. Since its launch in 1999, LEGO Star Wars has connected generations of fans who grew up with the original Star Wars films and building with LEGO bricks to today’s children who discover the Star Wars universe through exciting new content and toys, making it one of the best examples of intergenerational play. Click here to view photos in our Image Bank.